During the first quarter of film history, film language very quickly cemented itself into forms that would stay that way in mainstream cinema until the middle of the 20th century. Looking back at the surviving imagery of the first era of film (i.e. the silent era), it’s easy to see how these forms quickly solidified and became the norm for the typical and the innovative of the era. This language though, appears to have an almost musical quality with some of the strongest films of the era being composed as well as produced visually. The lack of sound while editing these films must have surely meant a natural desire for rhythm and texture to be achieved when splicing the film together? Could these images in fact be scored, written down and transcribed in the same way as a symphony or a string quartet? Popular song can be transcribed into a classical way (albeit showing its simplicities and missing the point entirely) so why can’t popular film? The images about to be discussed represent a tidy, if slightly inaccurate, bookend in the silent era but also define some of the basic language of cinema. That’s not to say they define all of it, far from it in fact. In between the thirty year gap of the films, dozens of directors will innovate in different ways, producing whole new techniques, qualities and even genres. What the films here do though is define a very basic but necessary aspect of cinema movement and can almost be considered as important as the key signatures of cinema or perhaps even the very basic bar lines that allow all sorts of new ideas to be contained within them in later years. Bar lines implies the fundamentals and indeed our first example is the fundamental piece of cinema. It has almost past into folklore with its initial audience reactions being debated greatly over the last few years. With the Lumière’s train rushing into the station film is given a solid form. 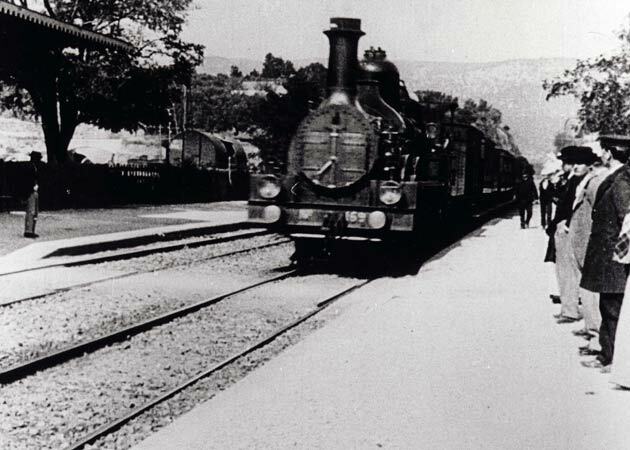 Its full title, Arrival of a Train at La Ciotat (1895), implies much in the way of documentation but with this piece of footage a visual, musical gesture is born. As the train rushes forwards, it instantly becomes a symbol for cinema, one of movement and dimension, supposedly perceived as inescapable and dangerous to the audience of its time. The movement is captured as breaking the vertical plane, almost setting out one half of the time signature needed for cinema to function in the first place. The train also casually breaks the line between fiction and reality, supplanting an image into a new context and making it terrifying. This idea shares more similarities with modern music than classical music but still, the parallel is there within sampling and the recontextualising of sounds. It just so happens that the Lumière brothers are using this technique before the new contexts themselves became the norm. Fast forward thirty years and the train is again defining the movement and rhythm of cinema, this time in a more comedic form. Buster Keaton’s The General (1926) is one of the era’s defining films, showing expert use of pathos, physical daring and a beautiful eye for imagery. It’s a fitting progression from the Lumière’s train in that the camera has now learnt to move. While the former set up the parameters for the rhythm, the latter expands on it allowing the camera to move in all directions, following the train while at the same time starting from the basic premise of documentation, this time alongside of fictional events. Keaton’s film however also manages to blend the same sense of worrying documentary in his film with the obviously dramatic elements. As the train of the enemy genuinely crashes through a burning bridge while being shot in side profile, there’s little to distinguish this crash from Lumière’s oncoming train when taken out of context. The rhythm has only vaguely changed, in some ways allowing Keaton’s train to become the number of beats in the rhythm while still using the basic note types of Lumière’s (in other words the two trains together represent the simple time of silent cinema and seem to fit allegorically around 4/4). With this basic nature of cinema defined and expanded upon within its first thirty years of existence, it’s not difficult to see why the train becomes such a focal point of silent cinema. There are many other images that define its coming into existence but not quite as effectively as the train. This is however just the basic template of capture and dimension. Even years before Keaton, cinema was constantly recreating (with some directors such as D.W Griffith, Abel Gance and Sergei Eisenstein having an arguably larger impact through their visual innovations) but with Lumière and Keaton there can at least be a line attached throughout the era, allowing for much to happen in between while highlighting the basic premise that cinematic dimensions have a positive, consistent rhythm.